I've never heard their music. I've never seen one of their videos. Until this past year, I dimly recalled them as an afterthought clown/rap act from the Lollapalooza era. Yet 2010 has been the year that the INSANE CLOWN POSSE passed up Courtney Love in my eyes as being the creme de al creme in don't-miss train wreck entertainment. It all started for me when I saw reports coming back this year from this rap duo's self-celebrating "Gathering of the Juggalos" (also known simply as "The Gathering") in the rural Midwest, where thousands of bruised, damaged, pot-smoking white people gather to celebrate their rapping, clown-makeup-wearing heroes and to squirt Faygo (a cheapo Midwestern soft drink) on each others' bodies. Apparently this year the band's many Gathering-attending fans, known as Juggalos, they were so incensed about the visit of a half-rate female celebrity named "Tila Tequila" that they pelted her with garbage, rocks and feces, leading to injuries to Tequila and a whole lot of press. I simply had to know more. 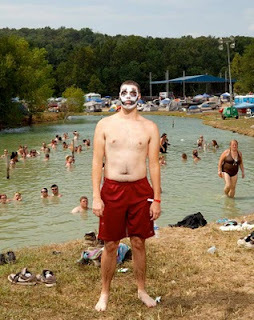 Without going into too much detail, I thought I'd direct you to a few key places to learn more about the Insane Clown Posse and their Juggalo world. Like Courtney Love, they are a bad joke to any right-thinking and music-considering individual, but far more interesting and worthy of your reading attention than thousands of decent and good-sounding bands. I wish I could provide you with the devastating Mark Dancey anti-ICP comics that ran in Motorbooty fanzine back in the 90s, which were hilarious and provided me with my first real introduction, albeit music-free, to the band. All I can find is this article on the controversy that ensued. Next would be this month's WIRED magazine, which, of all places, does a commendable job of providing an overview of Juggalo culture and even trying to generate some sympathy for the misfits who provide it its legions. Defintely check out the photographs of the young fans at The Gathering. The guy with the McDonald's-themed "Marijuana - I'm Smokin' It" shirt is my favorite, followed by the heavy-lidded stripper-looking woman on the ground, who looks like she may have very recently fallen down the stairs..
And if you want amazing photos, Kelly O's feature in Seattle's THE STRANGER is the best of the lot, and which I can't recommend enough that you gawk at right now. She needs to win photography's equivalent of The Emmy, despite her already rich source material. It all adds up to a phenomenon that I'm embarrased to only truly be turning my attention to now. Human beings come in all stripes, creeds and colors - we truly are a wonderful rainbow, aren't we? If I can find any excuse to come to 2011's Gathering ("for research purposes") and not get pummelled by the family that makes up this brilliant mosaic, I'm all over it.